There are 3,033 counties in the US and not many of them can boast that a President was born there, but Cayuga County certainly can. Millard Fillmore, 13th President from 1805 - 53, was born in a log cabin in what is now called Summer Hill, a small community in the Finger Lakes situated on Rte. 90 in the southern end of Cayuga County. On a snowy Sunday afternoon, my daughter and I joined the Cayuga-Owasco Lakes Historical Society for a Pot Luck Supper to celebrate his 213th birthday. After upbeat recital of American folk music and the sharing of good food, we sang a rousing “Happy Birthday” to this infamous gent. No one would say that Fillmore was a great President, but he did make the American dream come true. The story goes that a redheaded yo ung lady from Moravia – just down the road from Summer Hill - took a teaching post at an academy in New Hope where her oldest pupil was 19-year-old Millard. Gradually the relationship of teacher and student evolved into a romantic attachment. A long courtship ensued; they were finally married at the home of her brother, Judge Powers, when Millard was 26 and Abigail 27. Without a honeymoon, they settled at East Aurora, New York. Mrs. Fillmore continued teaching until the birth of their son. In 1823, Millard was admitted to the bar; seven years later he moved his law practice to Buffalo. 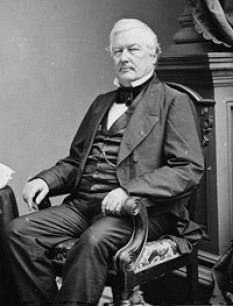 As a Whig, Fillmore held state office and for eight years was a member of the House of Representatives. In 1848, while Comptroller of New York, he was elected Vice President. The death of President Taylor in July 1850 meant a sudden accession to the Presidency for Fillmore. But back to Cayuga County. Tradition has it that Fillmore installed indoor plumbing in The White House. To celebrate this great accomplishment and after a hiatus of many years, The Town of Summerhill will again host The Fillmore Bath Tub Races on Saturday of Labor Day Weekend. On Sunday, there will be a huge Antique Auto Show at Fillmore Glen, a wonderful state park at the south end of the village. Today, you can camp, take a dip and hike through the Glen and then up and over on a 3.5 mile trail to the site of Fillmore’s birth log cabin. Bring your lunch as there is a picnic shelter with running water. An additional tidbit about Millard Fillmore is that he met another President who was also born in a log cabin - Abraham Lincoln. In 1861, Lincoln left Illinois by train and made a stop in Buffalo to call on Fillmore prior to continuing on to Washington. Lincoln stayed for about 3 days and attended church with Fillmore and his family. The Lincoln connection continues for Fillmore and Cayuga County. On Friday, April 28, 1865, President Lincoln&apos;s funeral train began its journey across New York State. Train stations were draped with flags as were private residencies along the way. Soldiers lined the tracks and men silently raised their hats to the hearse-car containing the remains of the truly lamented president. In Batavia, the train stopped and ex-President Millard Fillmore boarded, along with several other dignitaries. They remained on the funeral train until Buffalo when they escorted the remains to St. James Hall. Two days later, the procession returned to the railroad station and left for Cleveland about 10 am. Cayuga County was still in the news when Mary Todd Lincoln visited Moravia in 1872 helping to make Moravia famous internationally as “The Mecca of Spiritualism.” An exhibit about her visit, the history of the beginnings of spiritualism in Cayuga County and, of course, President Millard Fillmore can be viewed at the History House, West Cayuga Street, Moravia. Unlike other U.S. presidents who have their own libraries and buildings, the History House in Moravia has the only public exhibit of the 13th president&apos;s personal effects and memorabilia. Cayuga County can brag of William H. Seward, Harriet Tubman, Henry Wells, Lucretia Mott Osborne, Emily Howland, The Dulles Family - and President Millard Fillmore.